Winfield Township begins salting when the snow starts to accumulate and traffic safety is affected. We spread rock salt treated with a liquid organic based deicer, which will melt snow and ice when ambient temperatures are as low as 0 degrees. 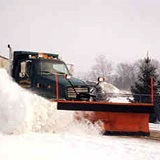 The Township’s goal is to remove snow and/or ice from the road pavement. The Township has adopted a parking ban but relies on the cooperation of our residents. There is also a County wide No Parking ban and you can be fined for parking on the street and/or road right-of-way (see page 17 for more information). Please do not park on your street if snow is anticipated or has not yet been plowed. Parking on cul-de-sacs, dead ends, turn-arounds and on the street should be avoided when plow trucks are out. Parked cars in these areas prevent the plows from removing the snow properly and/or turning around and are subject to being towed at the owner’s expense. Our crew does not intentionally “plow in” your drive nor aim for your mailbox. Our snowplows are of the same side delivery design as all other municipalities. This is the fastest and most efficient means to remove snow from streets. As a result, snow is discharged toward the road edges and inevitably into driveways. If possible delay the time you clear the driveway until the plows have cleared your street. Garbage cans should be placed off the road and on your driveway to avoid being hit by the plow. Prompt removal of empty containers is also recommended. Occasionally heavy slush discharged from a plow will knock down a mailbox. Most mailboxes, if properly placed and installed, will withstand heavy slush. The homeowner should periodically inspect and repair his mailbox in order to avoid it being damaged by heavy slush. The Township will not be responsible for damage to improperly placed or neglected mailboxes. If your mailbox meets specifications and is damaged as a result of our work, contact the Road District and we will replace it. Here is a good way property owners can clear their driveways to reduce the possibility of becoming snowbound after plows complete their work. By shoveling or plowing snow in the same direction as traffic and making a snow collection pocket, the snow collected by the plows will accumulate in the pocket rather than into the driveway opening. The Township is not responsible for damaged garbage cans. Placing your garbage receptacles well within your driveway, far enough away from the path of the snow plows will help to prevent your garbage cans from being damaged. This teamwork will also help your refuse collector to have a clear and full access to your receptacles. Your full cooperation is greatly appreciated by all.